Football 3A East Region Champions!! Rams won the 3A East region champion trophy with a 49-8 win over Petersburg. They will move on to the state semi-final against Western Albemarle next saturday December 6 at Wanner Stadium 2pm. This will be the first semi-finals appearance in 12 years for the Rams. https://wjccschools.org/lhs/wp-content/uploads/sites/20/2017/10/Lafayette-High-School.png 0 0 Daniel Gotthardt https://wjccschools.org/lhs/wp-content/uploads/sites/20/2017/10/Lafayette-High-School.png Daniel Gotthardt2014-11-30 19:02:012014-11-30 19:02:01Football 3A East Region Champions!! These passes are good for all home games during the regular season, doesn’t include any post season games. Attention Math Honor Society members there will be a Mu Alpha Theta meeting after school today in room 401. Do you love history? Do you love movies? Do you enjoy watching historical films? The History on Film Club presents âSpirited Awayâ on Wednesday, December 3rd at 2:30 in the Lecture Hall. Sophomores and Juniors interested in the Summer Residential Academic or Mentorship Programs may pick up an application in Counseling Office room 611. Completed applications and teacher recommendations are due to Ms. Hanks-Nicoll by Thursday, December 18th. Any Ram athlete who has signed a division one or two letter of intent to play college athletics next year please see Mr. Barner immediately. The girls’ soccer team will hold an informational meeting on Monday, December 1st at 2:30 in front of Coach Barner’s office. If you are interested in trying out please attend. The Forensics Team will be meeting today. If you are going on the next meet on, Thursday, December 4th you must be at this meeting. If you are unable to attend this meet, please contact your team captains or Mrs. McCorry. Attention Math Honor Society members there will be a Mu Alpha Theta meeting afterschool on Tuesday, November 25th in room 401. Do you love history? Do you love movies? Do you enjoy watching historical films? The History on Film Club presents âSpirited Awayâ on Wednesday, December 3rd at 2:30 in Lecture Hall. 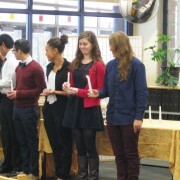 New members were inducted into the National Honor Society last Friday. The event was attended by the new inductees, their parents, and the current NHS members. Congratulations to Cailin Agnello, Carolyn Anderson, Yasmeen Coan, Cristian Coriano Ortiz, Sarang Patel, Mallory Whitten, and Symone Wilson. If you would like to see photos of the NHS induction, please visit the LHS Media Center Facebook page at https://www.facebook.com/lafayettehslibrary. AEP Chorus will not meet today; see you on Tuesday, November 25th. The Forensics Team will be meeting on Monday, November 24th. If you are going on the next meet on, Thursday, December 4th you must be at this meeting. If you are unable to attend this meet, please contact your team captains or Mrs. McCorry. Attention students today is the last day to get in on the library’s give away of 2 Mockingjay tickets. To enter, simply follow the library on Twitter @ lhslibrarians. We will pick a winner today at noon! Good luck! Attention Math Honor Society members there will be a Mu Alpha Theta meeting afterschool on Tuesday, November 25 in room 401. Mr. Rapach’s concert choir class filled the halls of Lafayette with a beautiful rendition of Shenandoah. 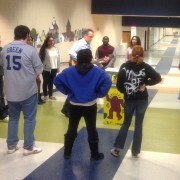 They will sing on Friday at the Virginia School Board Association convention at the DoubleTree Hotel at Kingsmill. 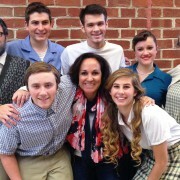 If you would like to watch a video of the song, visit the LHS Media Center Facebook page at https://www.facebook.com/lafayettehslibrary. Lafayette student Joshua Curtis displays his RamStar certificate. 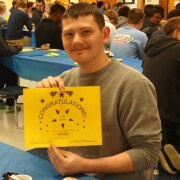 He was one of over a hundred students attending the November RamStar breakfast. Mr. Archie Jefferson, the student advancement coach, was the featured speaker. 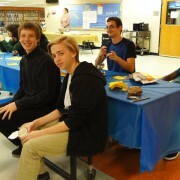 Over a hundred students attended the November RamStar breakfast. Mr. Archie Jefferson was the featured speaker.